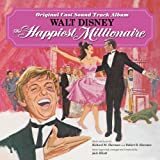 Valentine Candy – Paroles de la chanson dans “Le plus heureux des milliardaires”. Interprétée par Lesley Ann Warren. Oh, Miss Cordelia Drexel Biddle. I thought I knew you well. But now, Miss Cordelia Drexel Biddle. Are you valentine candy or boxing gloves ? Lately you seem very strange. What in the world’s coming over you ? Are you sonnets by Shelley or Rover Boys ? Once, any answer would do. Why aren’t you something ? One thing ? Which kind of someone are you ? Is a boy meant to spar with or gaze at a star with ? Should you kiss him or blacken his eye ? Now if he buys you roses, a right to the nose is. Really quite not the proper reply. You’re so lost in the middle up in-between. Is your destiny canvas or crepe de chine ? Will you someday be someone that somebody loves ?